Team Ammirato Construction is helping lead the way to Alzheimer’s first survivor by participating in the Alzheimer’s Association Walk to End Alzheimer’s. 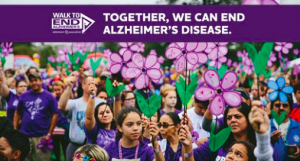 Currently, more than 5 million Americans have Alzheimer’s and that number is expected to grow to as many as 16 million in just the next 30 years. Our future is at risk unless we can find a way to change the course of this disease. We have an employee who is fighting this disease with his mother; and a dear friend who lost her mother to this horrible disease. We would love it if you could participate in this walk with our team, but understand not everyone will be able to do so. There is no obligation to donate but it would be greatly appreciated.